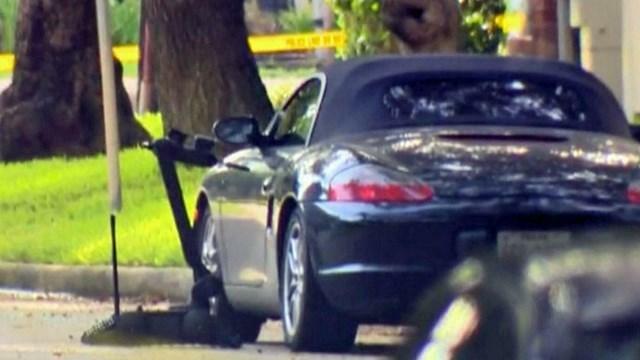 Victim's wife: Gunman who fired at Houston motorists was "aiming to kill"
HOUSTON -- A disgruntled lawyer who had numerous weapons randomly shot at drivers in a Houston neighborhood Monday morning, hitting six people, one critically, before he was shot and killed by police, authorities said. Another three people had injuries from glass or debris. Numerous weapons were found at the scene, a bomb-squad robot examined a Porsche that’s believed to be the shooter’s and bomb squad officers also were scouring the suspect’s residence, Montalvo said. The entrance to the condo complex, which is near the affluent enclave of West University Place, was still blocked off with police tape late Monday morning. Several cars with bullet holes and shattered windows were at a nearby strip mall. After the shooting stopped at 7:15 a.m., Molleda found her husband, 49-year-old Alan Wakim, several blocks away in the parking lot of a nearby strip mall. His Mustang had two shots that went through the windshield, and he told her that he saw a red laser beam before the shots were fired. He was taken to a hospital to be treated. Molleda said she didn’t know the suspect very well, and described him as quiet. “He’s a normal, average Joe,” she said. Jason Delgado, the property manager of The Oaks at West University condo complex, confirmed that police are going through a residence. He also said that there were two recent incidents involving the suspect. In August, Delgado said, police were called after roofers working in the complex said he pointed an assault-style rifle at them. He says there wasn’t enough evidence to move forward with charges because the suspect contended he didn’t point the gun at roofers. Molleda mentioned the same incident. And last week, the man became upset because of water pressure problems at his home, asked for maintenance help and expressed his displeasure in an email to the management firm that implied he’d “intimidate his way to getting what he was asking for,” Delgado said. Another witness, 30-year-old Antwon Wilson, inadvertently drove into the shooting scene after dropping off his girlfriend at work and could “literally hear the gunfire flying.” He managed to flee and escape injury. Lee Williams left his home in the neighborhood upon hearing gunshots and began directing traffic away from the condo complex, noting that people usually cut through the area to avoid some busier intersections. One car ignored him, he said, and was immediately shot at. Williams couldn’t see the gunman because it was dark, but believed he saw the muzzle flashes. Of the nine people hurt, Houston Fire Department spokesman Ruy Lozano said six were shot and three had minor injuries related to glass. Montalvo said one person was hospitalized in critical condition and another in serious condition.